vTigerCRM 6 RC(Release Candidate) version was released. We updated our demonstration site of vTigerCRM6. We are confirming behavior of Mobile API now. We are going to let CRM TOUCH support vTigerCRM6 as early as possible. 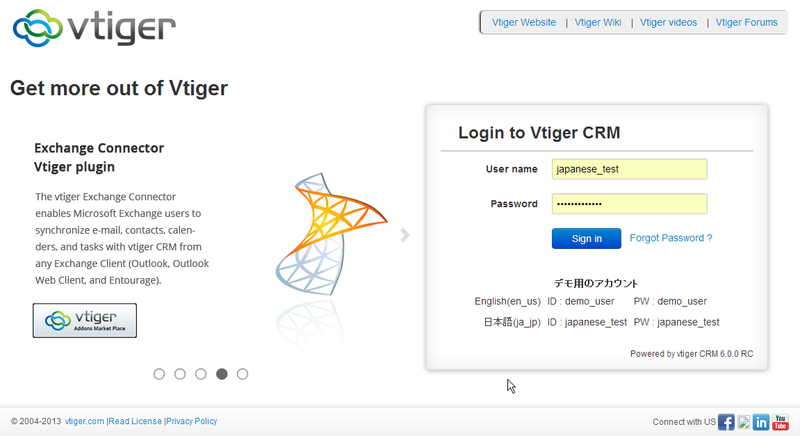 vTigerCRM 6RC (English & Japanese Language) Demo Site. vTigerCRM 6 RC(Release Candidate) version was released. We updated our demonstration site of vTigerCRM6. Merry Christmas everyone! Thank you for watching, commenting and liking to this page . Copyright © 2013 CRM TOUCH for vTigerCRM. All Rights Reserved.